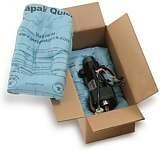 Foam in bag packaging system, Instapak Quick Bags, Riverside Paper Co. Convenient Pre-filled Bags are idea for small companies looking for the superior cushioning properties without any equipment expenses or maintenance. Foam in-place is activated with your hands, instantly. You can take Instapak foam bags anywhere. Due to their shape and size, some products may require more than two Instapak Quick® RT foam bags for adequate protection. This is a common occurrence when using the foam-in-bag packaging process. Convenient Pre-filled Bags - a protective packaging solution you can take and use anywhere. Room Temperature bags do not require a warmer to activate.